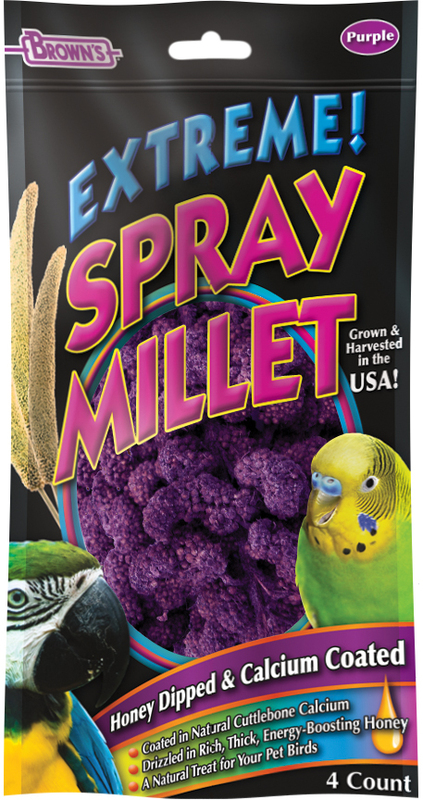 An excellent daily treat for domestic pet birds, Brown’s® Spray Millet is grown and harvested in the USA. Birds love spray millet because it’s rich in carbohydrates and protein. Brown’s drizzles each spray in rich, tasty, energy-boosting honey and then coats it with highly digestible blueberry flavored calcium from natural ground cuttlebone for even greater nutrition. An excellent daily treat for domestic pet birds, Brown’s® Spray Millet is grown and harvested in the USA. Birds love spray millet because it’s rich in carbohydrates and protein. Brown’s drizzles each spray in rich, tasty, energy-boosting honey and then coats it with highly digestible blueberry flavored calcium from natural ground cuttlebone for even greater nutrition. Your birds will find this healthy highly palatable healthy treat and supplement simply irresistible! Millet Spray, Calcium Carbonate, Dried Blueberry Powder, Gelatin, Honey, Color Added (Red 40 & Blue 1).